We need volunteers to work with HIV/AIDS orphans in Africa. Donations are also needed for AIDS orphanages. 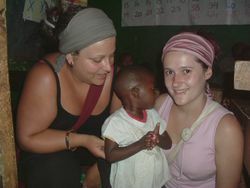 Volunteer work with HIV AIDS orphans is available in orphanages in several African countries. We work directly with the orphanages where you will work and where your contribution will make a real and meaningful difference. You will be offered a personal and customisable placement service. You will be also supported throughout the duration of your placement. You will work with & help orphans bereaved as a result of HIV/AIDS. Many of them will also be HIV positive. Others have been abandoned after birth due to their parents or their own HIV status or left in the streets to fend for themselves. HIV AIDS orphans in Africa are extremely disadvantaged and encounter a lot of hardships in their life. They are deprived of many opportunities necessary for their development. The children in our HIV AIDS orphanage projects have never experienced loving, caring and stable relationships. Orphanages in Africa have severe funding problems, lack basic facilities and proper sanitation. Orphanage volunteering is one way in which they are able to get help in labour and donations such as clothing, shoes and other essentials. As an orphanage volunteer, you will help vulnerable children. The children receive much needed attention, compassion, hope, encouragement, support and love from the volunteers. Through the education and compassion they receive from volunteers, the children are empowered to challenge life, poverty and exploitation. If you choose to do volunteer work abroad in HIV AIDS orphanages and help HIV orphans in Africa, you need to be adaptable, flexible and prepared to face and hear heartbreaking stories of the children's backgrounds. No experience or qualifications are required for HIV AIDS orphanage volunteer placements. Volunteer orphanage placements and voluntary work with disadvantaged children is very fulfilling. Volunteering with orphans in Africa will be one of the most challenging positive, life-changing, and rewarding experiences of your life. You will stay in the orphanage or with a host family near the orphanage. 1 - 3 volunteers will typically be based in the same orphanage and 2 - 5 volunteers in bigger orphanages with more than 100 orphans. We invite individuals, couples, families, students, researchers, and groups (churches, colleges, and student associations) for our voluntary orphanage work overseas. Our orphanage volunteer programs are flexible and volunteers can arrive and depart on any day all year round. The children’s home projects make for perfect volunteering work for college students and youth volunteering. By volunteering with orphans in Africa, you have the unique opportunity to make a real contribution to the community, while experiencing the rich African culture and different aspects of life in Africa.